Google Chrome is a great browser for staff and students to access powerful resources available via extensions. Extensions are add-ons or additional tools to help customize the browsing experience. For students, these tools can provide great assistance. For staff, the tools can create greater efficiency. Grammarly is a Chrome extension that helps users improve online writing through spell check and grammar checkm along with providing synonyms to needed words. The free version provides good assistance to help students double-check their writing in a discussion board or other online writing. Once you locate an extension through a Google search or the Chrome Extension Store, add it to Chrome by clicking on the blue button. Depending on the type of extension, a pop-up may appear with information about the extension or ask you to sign up for an account. 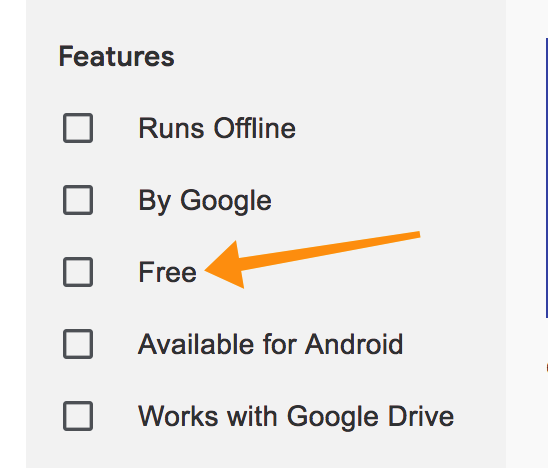 There are some fee-based extensions, but you can search only free extensions in the store by filtering your options in the sidebar. Once you add to Chrome, it will appear in the toolbar. To customize the extension, go to Windows > Extensions.Click here to view Google’s Extensions support page – very helpful. What Chrome extensions are beneficial to students and staff? The following is a modest list of Chrome extensions I find helpful. Great Suspender. I tend to have a lot of tabs open although I don’t regularly utilize them. For example, I always keep our library calendar tab open. This can take up computer battery power. Great Suspender will “suspend” the page so it will not consume the computer’s usage. Once I return to the tab, it will activate again. Alice Keeler Anyone Can View. I am a huge fan of author Alice Keeler and found this extension the most helpful. When creating a Google Doc, I click on the extension and the doc automatically changes to Anyone Can View. This extension is wo helpful when needing to get a document to multiple people or students. Bit.ly. This extension allows you to quickly create a shorter link to a web page. Read and Write for Chrome. *This extension is NOT free. * Although this is not free, I have to share how wonderful this extension can be for our students. With this extension, users can convert text to speech and speech to text and they can access picture dictionaries, annotation tools, and more. Mercury Reader, This extension is great for reading news articles online. The extension takes out the web page clutter and users only view the text. I would love to hear your favorite Chrome extensions. List in the comments section below. The Library Extension is by far my favorite Chrome extension. You tell it what your local public library/university library systems are and then when you browse Amazon and GoodReads, it will tell you in the browser if the book you are looking for is carried by your system. It even has a direct link for you to place a hold on the book. I use this extension almost every day, both for my own personal reading and for directing my students to public library resources. I also love the Great Suspender and Mercury Reader! Screencasting extension (Loom, Screencastify etc). For me, Grammarly is the most useful chrome extension I use often. Be it casual or academic Grammarly is definitely a safe tool to use in writing. Love these extensions! Thank you for sharing. Going to try out several!